Or as suggested by Cartoon Sara - Cybermanwiches! The premiere of the current Doctor came a rather infamous dish. I know that there are a million different versions out there, but I figured that I would share my own. The great thing about this recipe is that you can make the whole thing yourself or take a lot of short cuts if you are not much of a baker. Here we go, quick and dirty. I made my own pound cake but pretty much any recipe would do. A dense cake is best for this recipe because you are going to be handling the cake some and you don't want the whole thing crumbling in your hands. Once you cake is completely cool, cut the cake into "fish finger" blocks. Think about an inch or more thick because if you go too tiny, you can once again run the risk of the cake breaking as you try to work with it. Now, toast about a cup and a half of the shredded coconut (instructions can be found here if you need them). As you can see from the pics, I let mine get pretty dark. I wanted the color to be as uniform as possible. Just be careful not to burn the coconut because once it does start to toast, it goes fast. Next take half a cup of your jam of choice and heat it to loosen it up. I just nuked mine in the microwave for about 30 secs and stirred it. Hot jam is like hot glue, so be very careful with this stuff. You don't want to heat it so that it is like water, think more like a runny glue. And speaking of glue, that is exactly what you are going to be using the jam for. Take each "finger" of pound cake and paint it with the jam. Once covered in jam on one side, roll that side in the toasted coconut. Repeat this until you have covered all sides of the cake. The good news, you now have a super yummy fish finger. The bad news, do this over and over again until you have covered all your cake pieces. 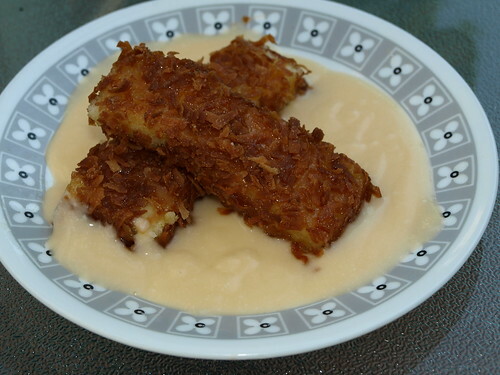 Once finished coating each piece, store the fish fingers in a single layer on a plate in in a container while you make the custard. If you find yourself out of room and you need to stack them, place a layer of wax paper in-between the rows to avoid a big solid sticky mess. Now, on to the custard. I am not a huge fan of custard, so I cheated a bit on this one and used Bird's Custard Powder. I've been told that this is kinda a staple in some British households, so using it is rather forgivable. Phew! Also, since I was making this for a lactose intolerant friend, i replaced the milk with coconut milk. Might I recommended this even if you are not lactose intolerant? The double coconut was super tasty. 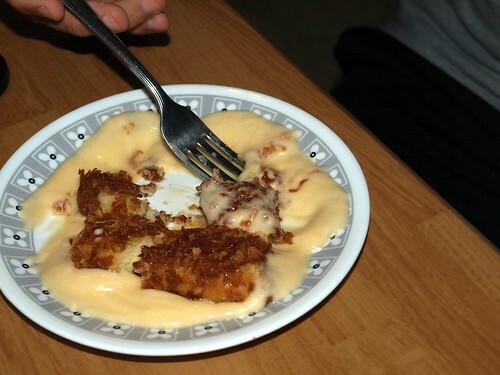 For serving, I reheated the custard and placed a healthy pool of it on a small plate. Top with about two fish fingers per person and have at it. The fruity jam help cut through the buttery and milky sweetness of the cake and custard, while the toasted coconut adds a welcome crunchiness against the soft cake. Mind you, it is improper manners to lick the plate, but what the others don't see, won't hurt them. Besides, the Doctor isn't one to stand on ceremony anyway. Do you have any food ideas for our next Doctor Who celebratory bash? Let us know below. I enjoy a challenge and would love some ideas on what to tackle next.